If you don’t like to blog, don’t have time to blog, or have a huge resistance to blogging – you are not alone! Many people feel pressure to blog, begrudgingly do it out of obligation, outsource it, or avoid it as much as they can. Many of my colleagues and clients have amazing businesses helping people eat better, exercise more, incorporate more mindfulness into their days, sleep better, learn how to cook, have more energy, eat more intuitively, eliminate foods they’re intolerant to, and generally become healthier. They are great at motivating and inspiring their clients and prefer the dynamic of working with people 1:1 or in groups, rather than on a computer. It’s just about why the heck I bother so much. I have a message. You have a message. Blogging is simply a way to get it out there. It’s a way to share thoughts, information, and vision with thousands of people whom I don’t even know. It’s a format that you can turn into whatever you want from sharing personal stories and “public journalling,” all the way to being a well-oiled strategic marketing machine for your business. When I blog on my site (here) I do “me.” I express me. I send out my message and see who that attracts. That’s one of the beauties of blogging – you get to be you and provide as much (or as little) value to your readers as you want to. Plus, you can always update what you say and make your posts even better than they were when they were first published. Blogging (and vlogging) is definitely a way to get my message out there and see what happens. My blog is a bit more casual and informal than what I write for my clients (I’ve never used “WTF” in work for a client). But my blog still has to showcase a few things. First, that I can write well. Second, that I care a lot about the quality of my writing and will produce amazing work that connects with readers. Third, that I understand health research and can translate it into easy-to-read articles that are informative and accurate. Fourth, that I’m consistent and won’t “ghost” you once you’ve bought a product or paid your deposit for my services. As a writer, I have to put my money where my mouth is, right? NOTE: I put my client work first, so I sometimes don’t have a lot of time to get my own post done and delivered with such perfection. Blogging allows me to continue doing what I love doing, and have been practising for decades now – research and writing. There is one massive difference between blogging and university/corporate/regulatory reports: I’ve had to learn and practice writing for real everyday people, not scientists. My very first blog posts were essentially technical papers. LOL It took me a few years of practice to really get the feel for being informal and speaking English (not “science-ese”). Most of my freelance writing is about research-based health information, and I sometimes write about health on my blog. I love mixing up the topics on my blog – some need more research than others. I sometimes put my well-planned editorial calendar on hold to share my thoughts on a new study or learnings from an event I attended. But, to be more strategic and valuable to my readers (who happen to also be health & wellness pros), I dove into the world of content marketing. That is, using content (mostly blog posts) to market a business. It’s using your blog to advertise your skills and knowledge 24/7 and to build that “know, like, and trust” factor with your audience on autopilot. I love knowing that you read what I write, and I want to know how helpful it is, and what your thoughts are about it. I’m not here to proselytize – I honestly just want to share information and am always, ALWAYS open to a discussion and feedback. Do you agree with my post? I put a lot into my blog posts because the internet is a big place. People search for every topic online. I want to be the most valuable answer to their question. When I write a new blog post, I think about making sure the value I provide is at least equivalent (if not more) than the time it took someone to read it. I want to be of service. I love doing something that’s in my zone of genius that can help a client or someone in my community. I love being a blog that people come back to week after week because they know they’ll get value from the time spent here. Blogging is partly “esoteric” touching on emotions, connecting with people, starting conversations, and teaching something. It’s also very measurable. I can see day-to-day week-to-week and month-to-month how many people visit my posts, where they came from, and which posts are the most popular. I love to stick to a weekly schedule and create something that I will be proud of. Sometimes that’s a challenge! I published on mine or someone else’s blog (sometimes both) on 61 out of the past 65 weeks and that’s a great run! Especially because I tend to spend about 6 hours on each post including research, writing, editing, formatting, creating images, and scheduling shares on social media & in my newsletter. 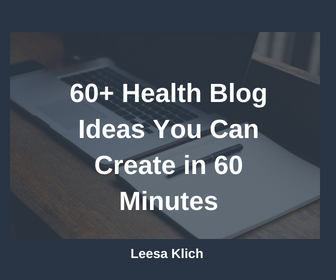 There are definitely weeks when I have a lot of health blog audits, coaching, or freelance writing work and I can’t spend the time I’d like to on my blog posts, but there is always the ability to make it part 1 of 2, or repurpose something I’ve already created instead of skipping altogether. There are lots of reasons why I blog. Not only does it help get my message out there and allow me to do what I love doing, but it also helps me start discussions with you. I also love that it is a way for me to provide value to you and challenges me to become a better writer, marketer, time manager, and business person too. 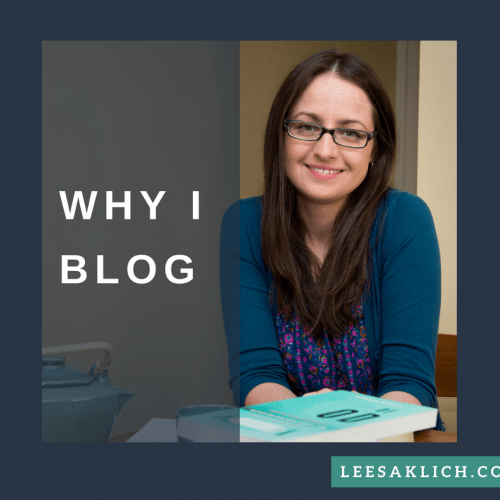 Do you have a blog? Want one? Love/hate it? Why? Have you seen benefits for you as a person or as a business owner? What benefits? Love it! I definitely blog because I like passing on information. Blogging is an amazing tool to share good info with our community, and just about anyone with an internet connection! Gosh! I love this post, Leesa! Thank you for sharing your reasons for blogging. I blog for similar reasons too. I firmly believe that regardless of your field or industry you should be educating your audience and sharing your message. I totally agree! Educating your audience and sharing your message are so key, and are especially efficient with a blog.